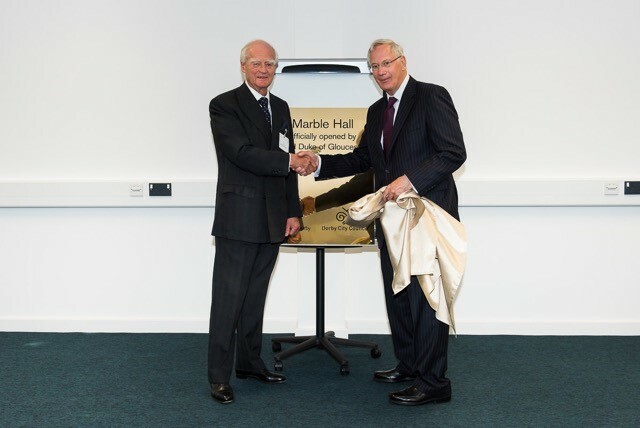 The Marble Hall development, delivered by Woodhead Heritage was graced with a royal visit on Tuesday from HRH The Duke of Gloucester KG GCVO as he carried out the official opening of the Grade II listed building on Nightingale Road. The iconic former Rolls-Royce building has undergone a £4million refurbishment and now serves 42 high-specification managed office spaces, a kitchen and training provision provided by YMCA Derbyshire. The Duke was greeted on arrival by pupils from the local Osmaston School and presented with a mosaic made specially for him, before Connect Derby’s Ann Bhatti introduced him to representatives from Derby City Council and Sir Ralph Robins, former chairman of Rolls-Royce. During the visit, the Duke reviewed the ground-breaking restoration work to bring the building back to public use. He was then introduced to the constructors and architects for the scheme, along with members of staff and tenants before unveiling a commemorative plaque to mark the occasion.